Put on your sleuthing gear and dive inside this deliciously funny mystery. You might have to plug your nose too! Great fun to read aloud, and for bedtime viewing as well. Help me or else we'll be cooked, served, and sauced." 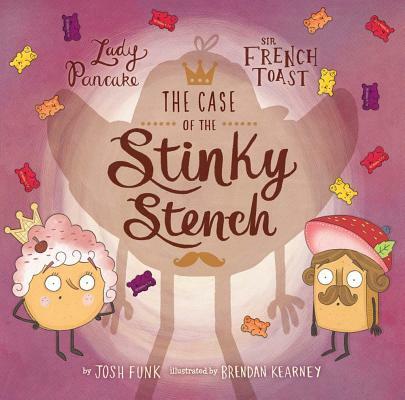 There's a stinky stench in the fridge--and our favorite foodie friends must solve a smelly mystery Sir French Toast's nephew, Inspector Croissant, begs him and Lady Pancake for help in finding the source of the foul odor. Could it be the devious Baron Von Waffle? A fetid fish lurking in the bottom of Corn Chowder Lake? Featuring the same delectable rhymes, wordplay, and art that won critical raves for Lady Pancake & Sir French Toast--there's even an actual red herring--this fun follow-up is an absolutely tasty treat for kids. Josh Funk is from MA where he spends his days writing computer language and his free time writing picture book rhymes. His first published picture book was Lady Pancake & Sir French Toast (Sterling) and he is the author of Pirasaurs (Scholastic), Dear Dragon (Viking), and the upcoming Albie Newton (Sterling, 2018). Brendan Kearney is an illustrator from the UK. While studying architecture at university, he realized he didn't like rulers. He then discovered that it wasn't essential to use a ruler when illustrating children's books. Now he specializes in illustrating children's books, bringing his own chaotic style and ideas to any project. He is also the illustrator of the first Lady Pancake & Sir French Toast and Bertie Wings It (both Sterling).